Orders shipped within Canada must have sales tax added to the total. 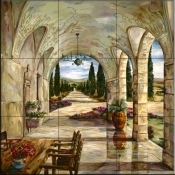 Customer will pay for shipping as billed by The Tile Mural Store Canada. Orders are normally shipped via UPS ground. Faster service is available - see options during checkout process. All orders that are shipped via UPS are insured at no cost to the customer. Tiles that arrive to the client damaged by UPS during shipping will be replaced free of charge to the customer provided that the customer notifies The Tile Mural Store within 24 hours of receiving the damaged tiles and complies with the requests made by The Tile Mural Store and UPS in filing a claim with UPS. The customer must retain all packaging material and the broken tiles. UPS will contact the customer to gain additional information about the packaging and tiles and the customer agrees to speak with UPS with regard to the damage claim. UPS will arrange with the customer to pick up the packaging material and broken tiles. The customer must leave the requested items in an accessible place for UPS to pick up. Tiles that are broken or damaged by the customer, or when the customer did not notify The Tile Mural Store soon enough to file a damage claim with UPS, can be replaced at a 50% discount of the original retail price. The customer will pay the shipping costs for the replacement tiles. All mural tiles have a number on the back of the tile. Please provide to us the number on the back of the tile that needs to be replaced. 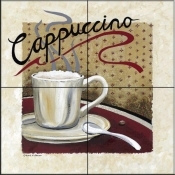 Only the digital tile murals can have individual tiles replaced without having to replace the entire mural. Returns will not be accepted without our prior approval. If you wish to return an order you must contact us prior to shipping it back to get a refund. Because your order is custom made just for you we must charge a 25% restocking fee on all returned orders. Please remember that we can not exactly match the colors on the tiles to the colors on your computer monitor screen or that print from your printer. Your computer monitor and printer have their own settings for how colors are portrayed and every monitor and printer is different. We can not match exact hues of colors and there will be subtle differences on the tiles from what you see on your computer monitor or print from your printer. If you need to match the colors of the tiles exactly to a color you want to use for your project we suggest that you order your tiles first and coordinate the colors for the rest of your project based on the actual colors of the tiles. Do not rely on the hues you see on your computer screen or that print from your printer for color matching. Refunds are given only if the tiles are returned in their original and new condition. Designs that are altered in any way from the way they appear on the site (examples - placed on the diagonal, removing borders, changing colors) may not be returned, custom sizes, etc.. 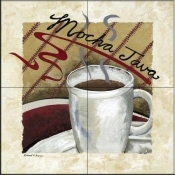 Custom tiles, such as tiles made with your supplied art or picture may not be returned. Tiles that are damaged or in any way altered from the way they were shipped to you may not be returned. All returned orders must be shipped back to us by UPS, insured to their retail value, and within 10 days from the date you received them. You must contact us prior to returning the tiles in order to receive a refund. All items usually ship within a week or two of placing your order. We can sometimes complete an order more quickly. 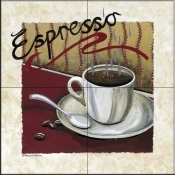 If you need the tiles by a particular date let us know and we will let you know if we can accommodate your request.